The role of animals in God’s creation was the topic of the most recent Tablet Forum conducted May 10 at Christ the King R.H.S., Middle Village. The session featured the N.Y.C. 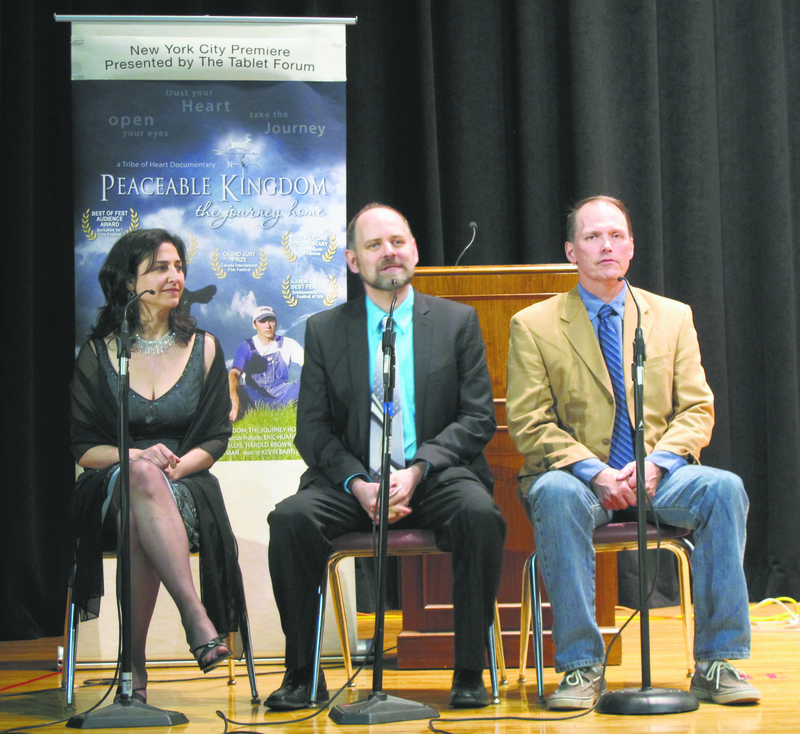 premiere of the film, Peaceable Kingdom: The Journey Home, a group discussion on animal rights and a tasting of vegan delights. Nearly 500 people attended. “Tonight, my prayer for you is that your heart and soul will somehow be touched by the breadth of tonight’s award-winning documentary film,” said Father Frank Mann of The Tablet staff as he introduced the movie. “I also pray that you might find yourself surprisingly transformed – transformed in such a way that you will become emboldened champions – guardians as it were – who will make a profound difference for the dignity of all created life. The film documents the food industry’s cruel treatment of farm animals as it prepares them for market. It also traces the conversion of former beef farmer Harold Brown from his life of working on farms to being an advocate for humane treatment of animals, including encouraging people to stop eating meat and meat byproducts. He serves as a resource for farmers seeking to transition to solely plant-based agriculture through his charitable organization, FarmKind. “The meat industry is supply and demand,” said Brown, who participated in the post-film discussion. “If we stopped providing a demand,” the inhumane treatment of animals would cease, he maintained. Rinaldo Marro, a parishioner at St. Sebastian’s, Woodside, said that humans too often take animals for granted for their own selfish reasons. “I felt that as a human being, what I learned here is that we do not see lower forms of life as having the same kinds of sensitivities that we do,” Marro said. “Just because they’re non-human doesn’t mean they’re not creatures of God. They deserve the respect that the film seemed to portray. “We believe that if all of us follow our instincts and values, all of this will change for the better,” LaVeck said. LaVeck said he enjoyed working with Father Mann throughout the planning process, and he, as well as the attendees, instantly recognized Father Mann’s passion for the topic. After the group discussion, attendees could continue the conversation in the school’s cafeteria and had the chance to speak to the filmmakers in a more intimate setting. Guests could enjoy vegan foods such as soy-based meatballs, yogurt and chocolate made without meat products. There also was information about animal-free-food restaurants in the city and access to materials about topics discussed in the film.